Synthroid is a brand name for levothyroxine -- a thyroid replacement hormone prescribed by your doctor for low thyroid function. Hypothyroidism can slow your metabolism, leading to weight gain, and affect body temperature, making you more sensitive to cold. Synthroid must be taken daily on an empty stomach and can interact with other prescription medications, vitamins supplements and foods. Although there are no vitamins specifically for people who take Synthroid, it's the timing of when you take your medications that is most important. You can avoid drug interactions by waiting several hours after taking Synthroid to take your vitamins. Vitamins that contain iron and calcium can block your body from absorbing Synthroid. This doesn't mean you shouldn't take additional iron or calcium supplements; but it does mean that you need to take your Synthroid first to give it time to pass into your intestines to be fully assimilated by your body before taking any substance that may interfere with that process. According to Drugs.com, you must take your Synthroid at least four hours before or four hours after taking any supplement that contains calcium carbonate, iron or aluminum -- such as antacids. Certain cholesterol-lowering and ulcer medications can also block the absorption of Synthroid. There are no vitamins made specifically for people with hypothyroidism who take Synthroid. The best vitamin for you is the one that includes the correct amount of vitamins and minerals that you need to supplement your diet or that you may need for any other underlying health issues. Hypothyroidism is not caused by a vitamin deficiency, but most often by an autoimmune response. Although certain vitamins or changes in diet may help treat the symptoms of hypothyroidism, only replacing the missing thyroid hormone will treat the problem. Even though in rare instances an iodine deficiency can cause low thyroid function, iodine supplements are not recommended for people taking Synthroid because iodine only treats hypothyroidism if that is the cause. Too much iodine can actually make hypothyroidism worse, says UMMC. Your diet and supplements may help support thyroid health, but only Synthroid actually provides the missing T4 hormone that your thyroid gland isn't producing. However, you can help relieve the symptoms of hypothyroidism by ensuring adequate intake of B vitamins -- found in vegetables and grains -- and antioxidants -- found in fruits and vegetables. Omega-3 fatty acids, found in fish such as salmon, mackerel, trout and sardines, can help boost your immune system, which may be affected by your metabolic slowdown. The majority of nutrients, vitamins and mineral you need should come from your diet. Including a variety of healthy foods, such as vegetables, fruits, whole grains, healthy fats and lean proteins should ensure you get all the nutrients your body needs. Vitamins should only be used as supplements, not as replacements for eating a well-balanced diet, says the National Institutes of Health. 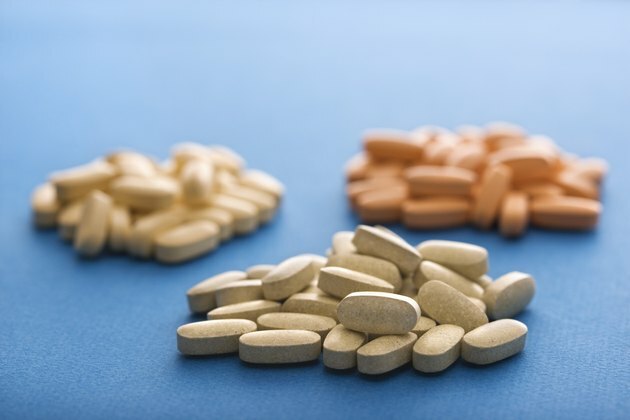 Dietary supplements are not tested for safety for the Food and Drug Administration the way that drugs are and can contain vitamins, minerals, herbs and other substances. Always check with your doctor about possible interactions between your Synthroid and any prescription, over-the-counter or herbal supplement that you might take.